It actually arrived just as we were getting ready to head out to violin lesson. Never was it harder to force ourselves to go out to our violin lesson! We spent a couple hours sorting them out Thursday evening. We left the boy sorting them while I took The Girl to her Tap Dance Class. She didn't even want to go. She's NEVER not wanted to go to Tap... She's gotten weepy and pouty on the rare occasion that I wasn't able to get her to Tap.... THAT's how excited everyone - including The Girl - was about the arrival of all these goodies. Our respective collections (mine is in the middle - we really did get in on this so I'd have relatively inexpensive stuff for the kids to paint while they're still learning to paint). Io picked one or two things I was actually interested in, and then got what no one else could be talked into taking... 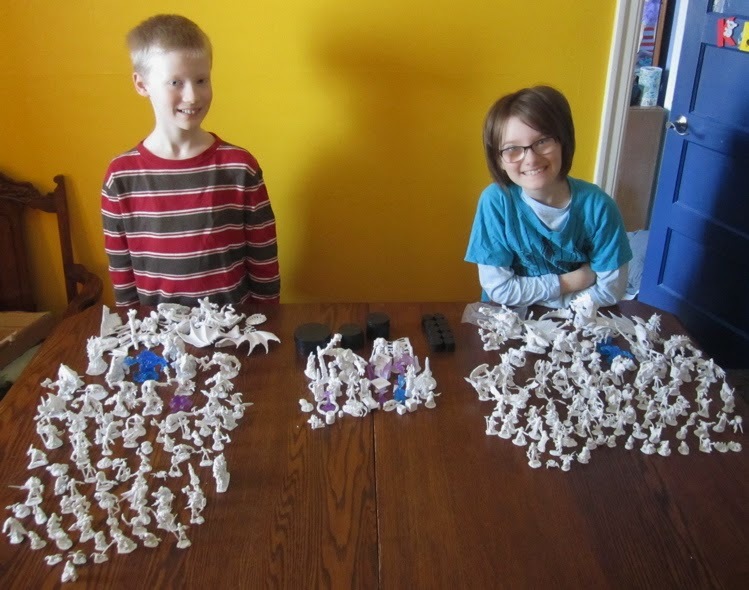 The Boy's collection looks a bit bigger than The Girl's, but that's because he picked more large beastly-monster type things. 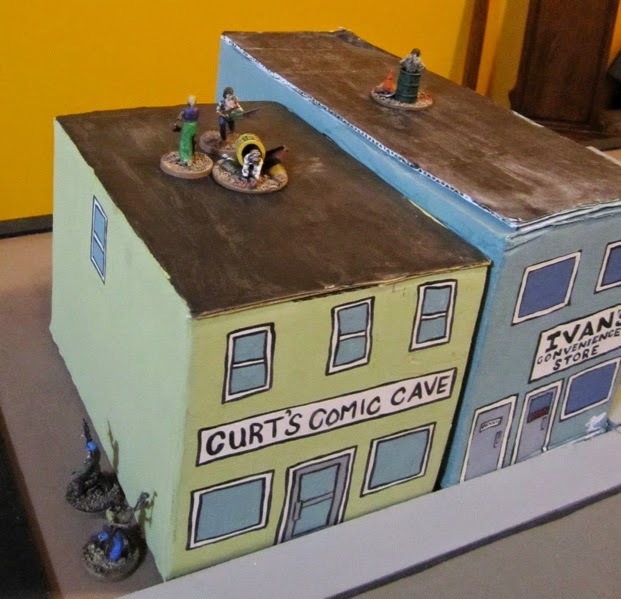 For the last decade and a bit I’ve been celebrating my birthday with friends, dice and little men made of lead. Sometimes it’s just one big game the evening or afternoon of my birthday – or other times it’s been an entire weekend affair on a weekend close to my birthday. For this year I’d originally planned to run a Song of Shadows and Dust campaign over the Family Day long weekend two weeks ago… but that kind of fell through. I DID end up playing games all weekend - which was super fun – it wasn’t quite the minicon/campaign weekend it’s been in the past… and it was two weeks ago… it was more… well… a long weekend of playing games with the family (and a few friends) and didn’t seem at all connected with my birthday (except for the fact that "John brought me two Dr. Grogdbort graphic novels as a birthday present! 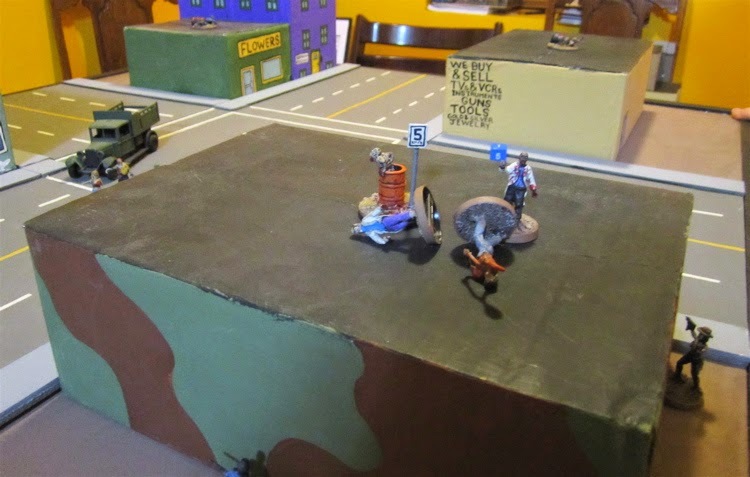 WE pretty much used the “Zombie Infestation” scenario right out of the book, with the exception that the survivors had only 200 points and the zombies had 300. Also I added that the survivors were looking for supplies and could alternately win if the could locate 3 batches of supplies and exit with them off their own table edge. 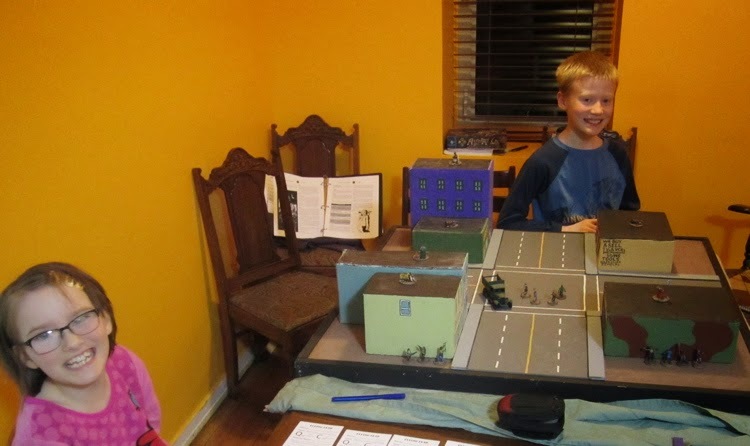 To locate supplies they had to enter a building then spend an entire turn searching it (quality roll on three dice – 2+ successes = supplies found, 1 success = try again next turn, 3 failures = no supplies in this building). 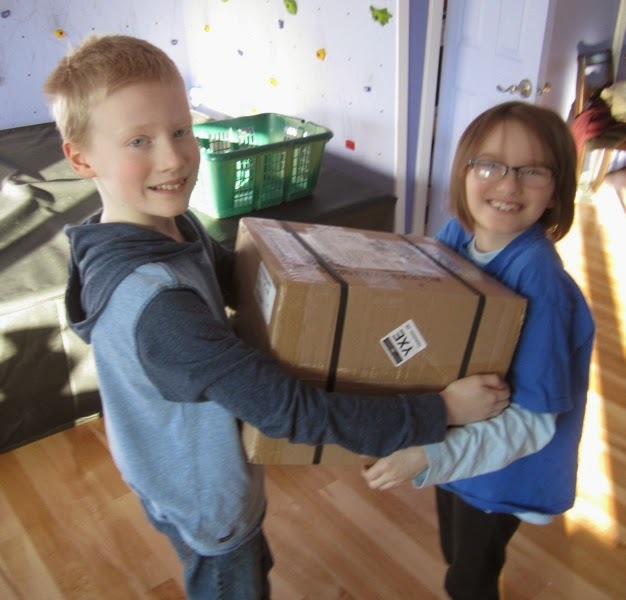 Supplies were heavy and required two hands to carry – one person could do it but move would be reduced to short, if two carried it they could move at medium. An action was required to pick it up. If engaged by zombies they automatically dropped the goods. 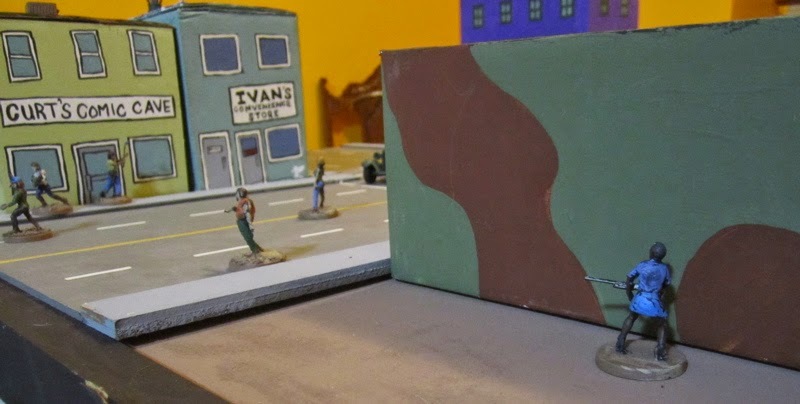 Some of the zombies could also be hidden in buildings – I dug out my old Zombie Hot Spot Markers to mark the different buildings (1-6 – though I suppose The Boy could just have easily written the names of the businesses for the buildings which zombies were hidden in…). The Kids all set up and ready to go. Only four of The Boys zombies were out in the street. 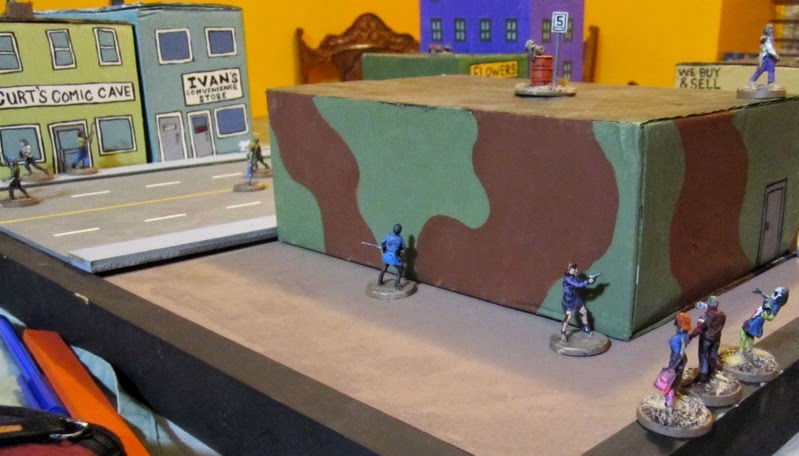 Four of them were hidden in buildings and the remaining seven were off the table waiting to come on as reinforcements. One of them only made two moves in the entire game. Amanda the Zombie Hunter with a Chainsaw burst in the back door of Curt’s Comic Cave and found a zombie waiting in there for her. She quickly dissected it with her chainsaw and began to search for supplies… not sure what sort of supplies they were hoping to find in a comic store… perhaps back issues of The Walking Dead to learn more about what they’re up against? 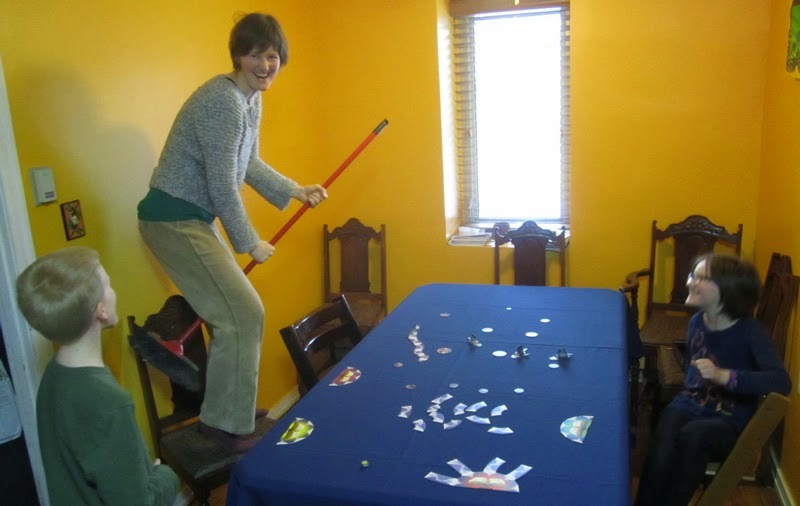 One of the Zombies that had started in the middle of the table finally made its way to where Susan and Clarissa had been cowering since the first turn – unable to move. Amanda saw it shamble past and burst out the front door to saw it in half. Unfortunately all this noise out in the street drew the attention of some of the zombie reinforcements. The next turn she did get the two actions she needed to take an aimed shot and blew its head clean off! Somewhere around this time the zombie that had eaten Shelly, shambled to the door and ate Sally – who had been standing there doing nothing for a few turns perhaps in shocked silence after witnessing the gory death of her comrade… or maybe she was just standing their screaming the whole time… not sure… but she got eaten too. 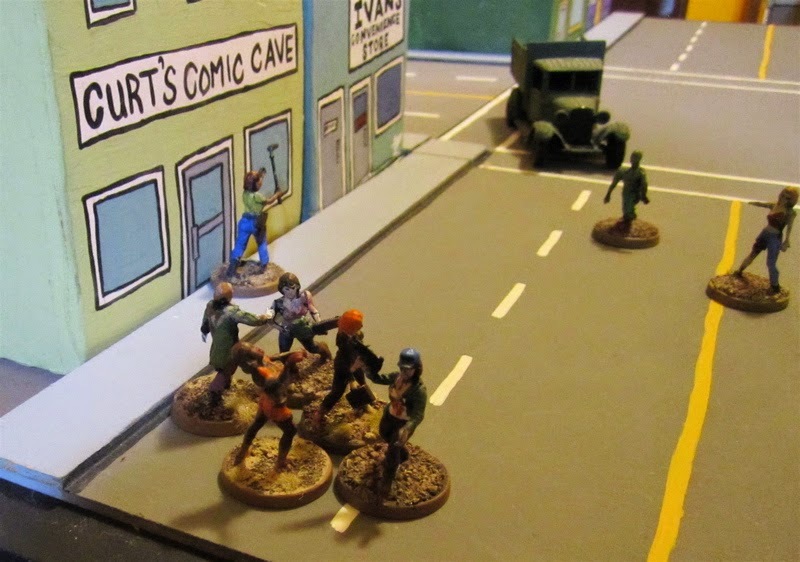 The reinforcement zombies tha arrived near the Comic Cave chased Susan and Clarissa out of their hiding spot. One of them gunked up Amanda’s chainsaw and caused it to stall… luckily she got it started again before anything dreadful happened. 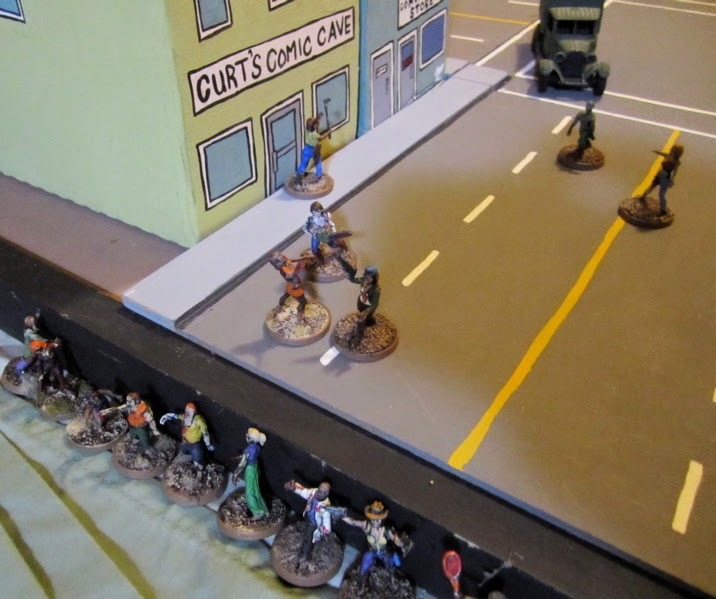 All the ruckus – screaming and sawing and shotgun blasts – eventually drew the attention of the remaining zombie reinforcements. Amanda steped in and sawed through two zombies that were trying to get at Susan. A zombie shambled forward and tried to take a bite out of Jessica, but she managed to knock it down long enough to make good her escape. 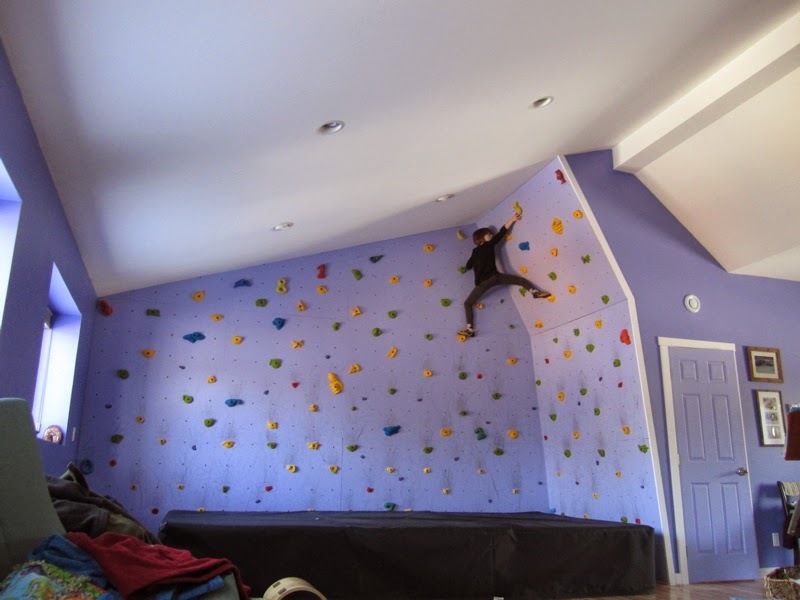 At this point The Girl decided to cut her losses and try and escape with what she could. 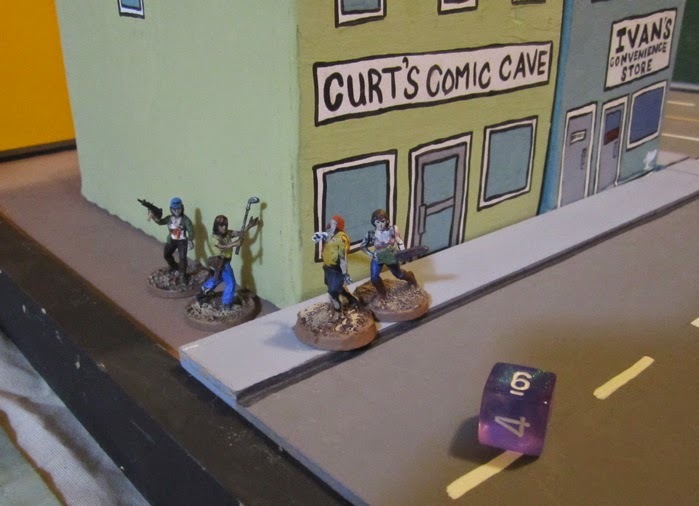 Mackenzie knocked down a few more zombies wither shotgun, but they just wouldn’t STAY down because she couldn’t get her sh!t together enough to AIM FOR THE HEAD… Amanda finished off the zombies out front of The Comic Cave and came running to try and help Mackenzie, but she was too late. The zombies ate her and Amanda failed a fear test and ran off the table. Of the seven that went looking for supplies only three came back. Of the nine zombies that were killed – seven were taken out by Amanda and her chainsaw! Chainsaws are wicked awesome against zombies! 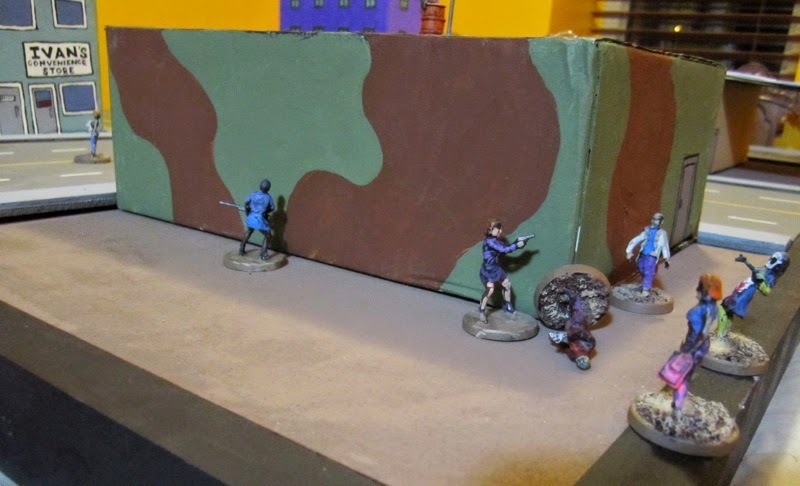 The kids had a great time – it has been WAY too long since we actually played a miniature skirmish. I think this may actually be the first one so far this year!? 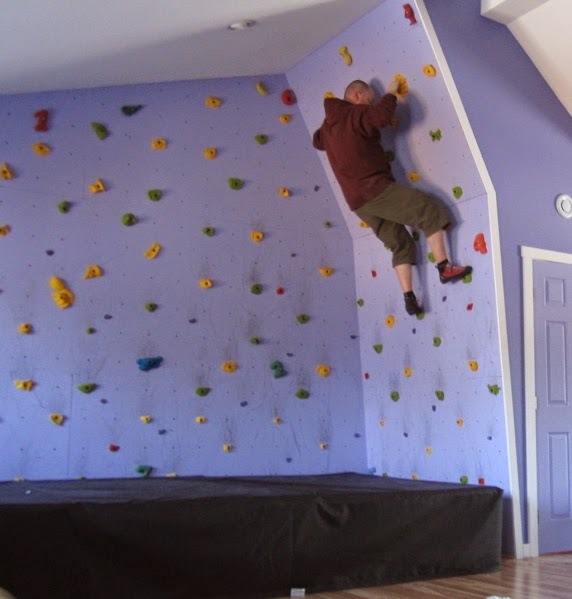 Hopefully this will inspire us to do some MORE! I like Fear and Faith – there are some subtle differences between it and A Song of Blades and Heroes and – being the big dummy that I am – I sometimes had trouble keeping them straight and/or just forgot, but it made for a fun and interesting game and I’m looking forward to playing it some more! 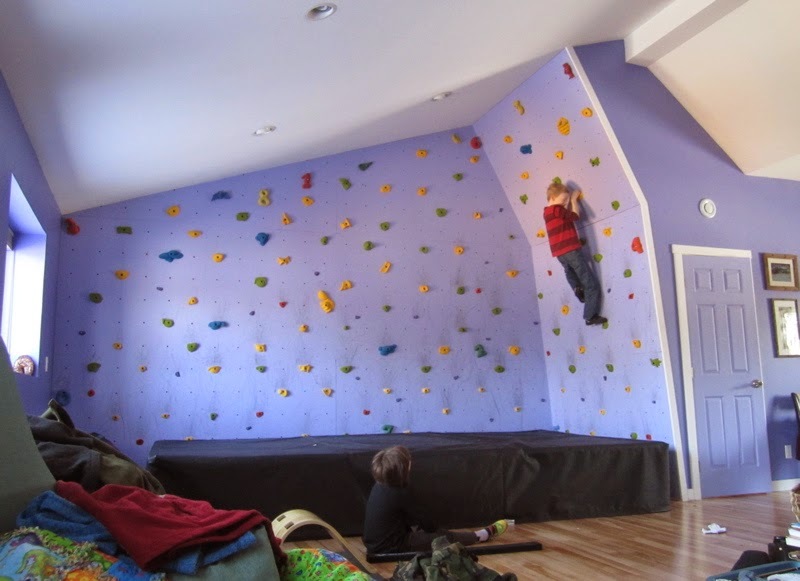 Though I’m tempted to have a go at Flying Lead… or perhaps Flashing Steel… too many games, not enough time! Not sure… more painting…? Another game report…? 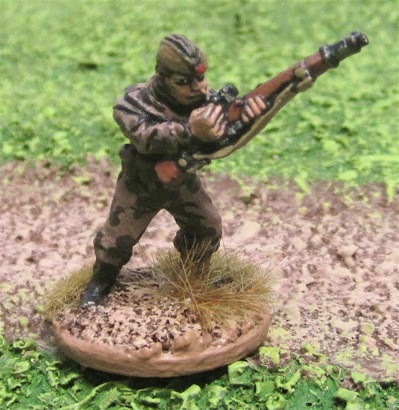 I’ll post some pictures of the entire platoon in the 28mm World War Two Gallery shortly. 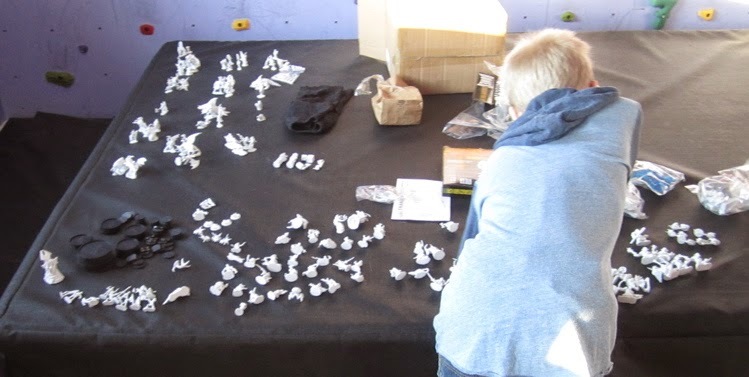 A game report of the 11th Annual Wargaming Birthday Bash! 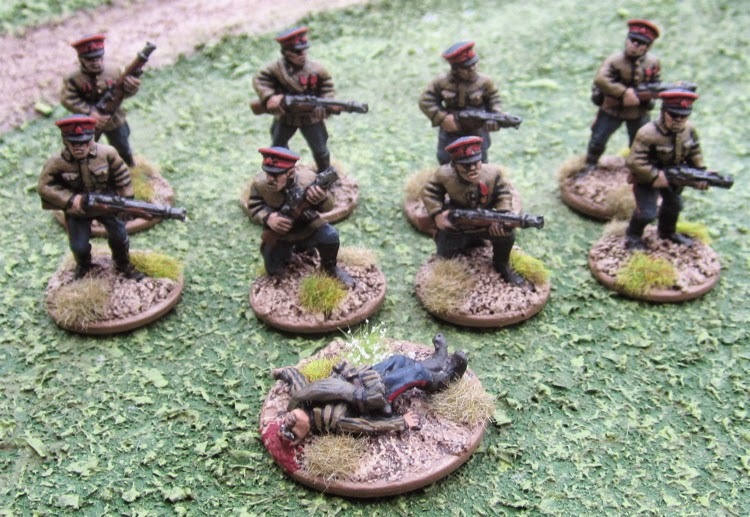 28mm WW2 Soviets – Done and DONE! Last evening I finished up one more batch of WW2 Soviets and this lot finished off ALL of the 28mm WW2 Soviets I have (and ever hope to have!). Here are the rest of the Officers, Staff and characters. These would make up the company command, perhaps some forward observers, and perhaps visitors from the Battalion or Regimental HQ – there’s even a General and good ol’ Comrade Stalin himself in that lot. Four more Russian zombies – also from West Wind Productions. Gosh… where to go from here… paint more stuff… PLAY SOME GAMES!? Continuing with the drive to finish off my 28mm WW2 Soviets – I bring you the last of the tanks and casualties (and a couple others)! Three T-34/76 tanks from West Wind Productions. 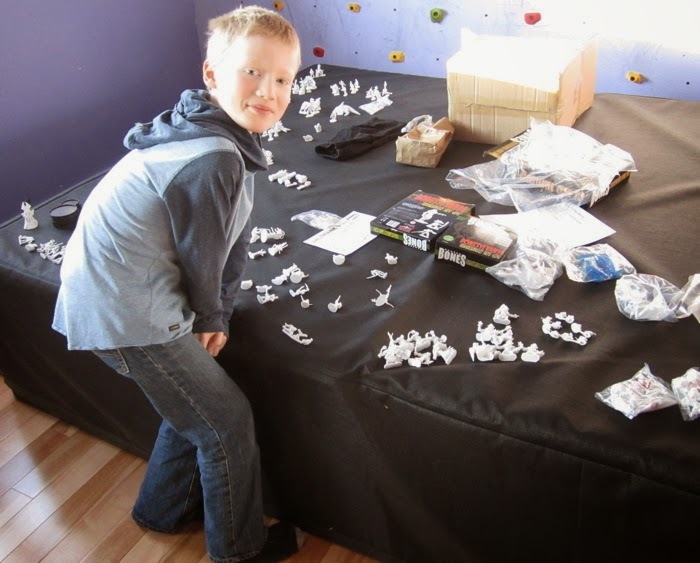 So I bought a platoon of five T-34, a troop of Shermans for my Canadians, and a Tiger, two Panthers and a later Panzer IV… I have yet to assemble the German tanks. 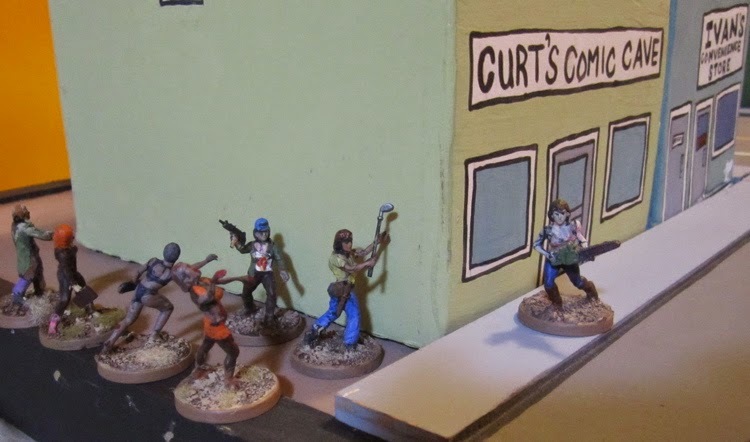 Four remaining casualty figures I had to finish up from Black Tree Design. Two other odd items found in the WW2 Soviet box. A Black Tree Design sniper and a spy (or some such) from Blue Moon Manufacturing. I have a few officers and odd things to finish up then all the WW2 Soviets will be DONE! I think there's less than 20 at this point. 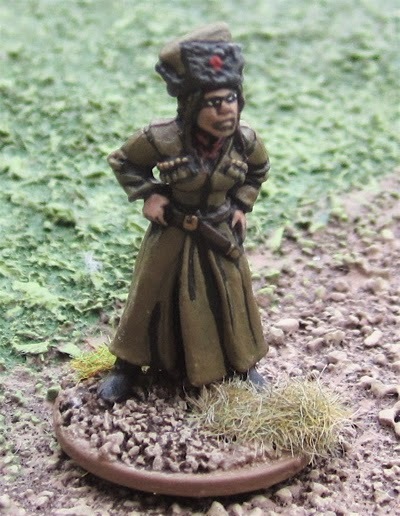 Then it'll be time to do a massive update to the 28mm World War Two Gallery! In the Province of Saskatchewan The third Monday of February is a statutory holiday called Family Day. This Family Day long weekend we had a Weekend of Gaming!! Originally I’d planned to have a Song of Shadows and Dust campaign – but that kind of fell through as only Paul (in Winnipeg) and Terry (in Edmonton) showed any interest and so I decided to call it off – it seemed a bit much to ask them to collectively drive almost 1300km just to play games with each other and possibly me and The Boy… AS it turned out this was really for the best as we ended up having a massive blizzard over the weekend and the roads and highways are just awful! The complete and utter lack of interest/response from my regular gaming pals for this weekend put me into a bit of a gaming funk for a bit… and then I missed Freezerburn and spent five days in hospital (not related)… after that I decided “screw it” I’ll have a weekend of just gaming with my family. And after another bit I decided to invite a few others to join in as well…. I ran a Call of Cthulhu adventure called Cold Harvest. I used a homebrew mash-up set of rules using elements of Fear and Faith, Flying Lead, and A Tale of Blades and Heroes. I wanted something simple so the focus would be on the “role-playing” and not the system of rules. I wanted the focus to be on the role-playing as the adventure is investigation heavy with very little action. Unfortunately I also wanted to run it as a one-shot, one evening adventure… and one of the three players had to spilt just after 10pm giving us only three hours to play it in… so I tired to rush it a bit… and left bits out (some on purpose, others because i forgot about them in the rush)… and then we didn’t even get to really finish it… so it was a bit of an anticlimactic fizzle to start off the weekend. Luckily things went up from there. This is when the snow REALLY started to fall. It was also blowing and drifiting. 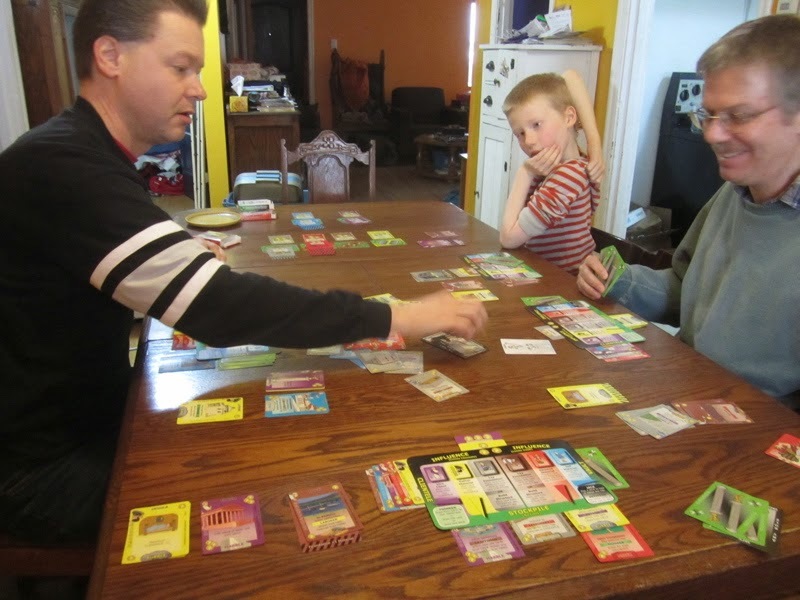 After Glory to Rom Rick had to leave so Other Tim, The Boy and Myself busted out Ingenious. Around the time we finished Amanda and The Girl staggered in having clawed their way through and over countless snowdrifts between our place and the hair salon downtown. At this point Other Tim had to be on his way and I headed out to start shoveling snow. 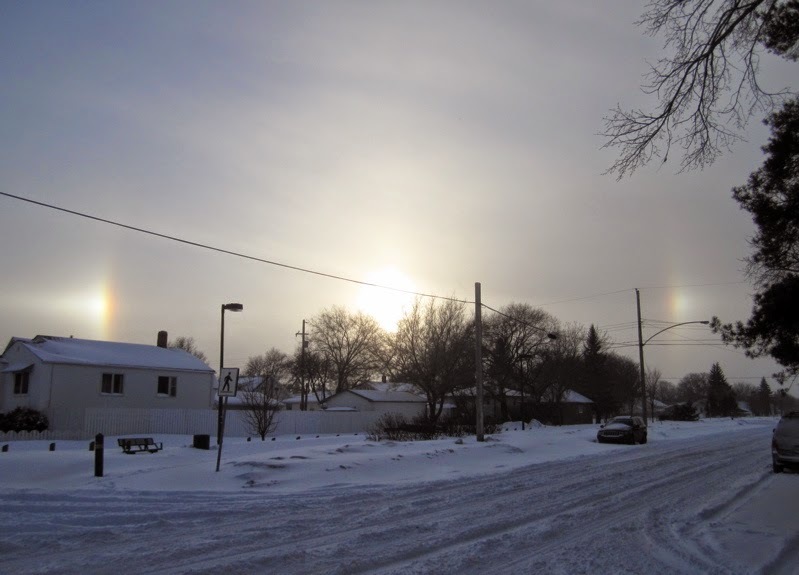 Sun Dogs on Saturday afternoon. For those that haven't heard of them they are the lights to either side of the sun in the picture and is the sun’s light being refracted through ice crystals in the upper atmosphere. Generally only visible when it’s really freaking cold. 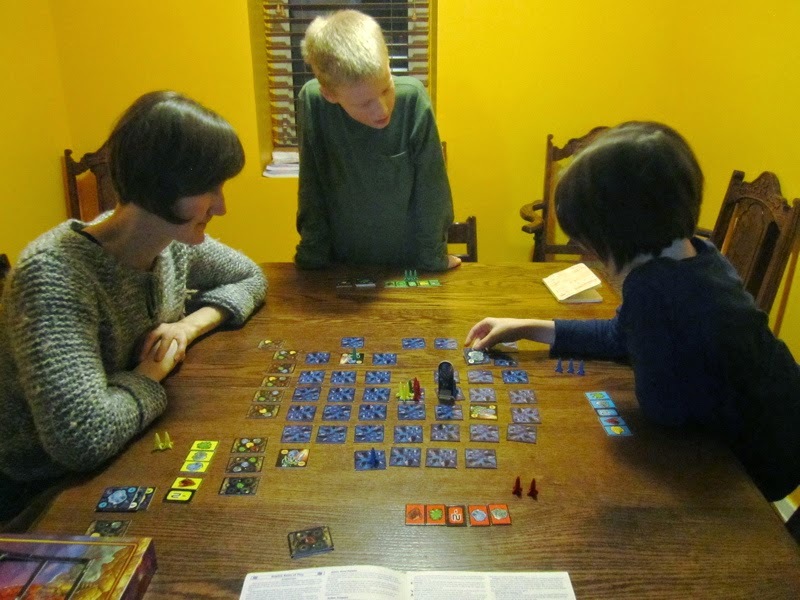 Finally we played another new to us game (also bought cheap off ebay from the very same distributor – also $5). 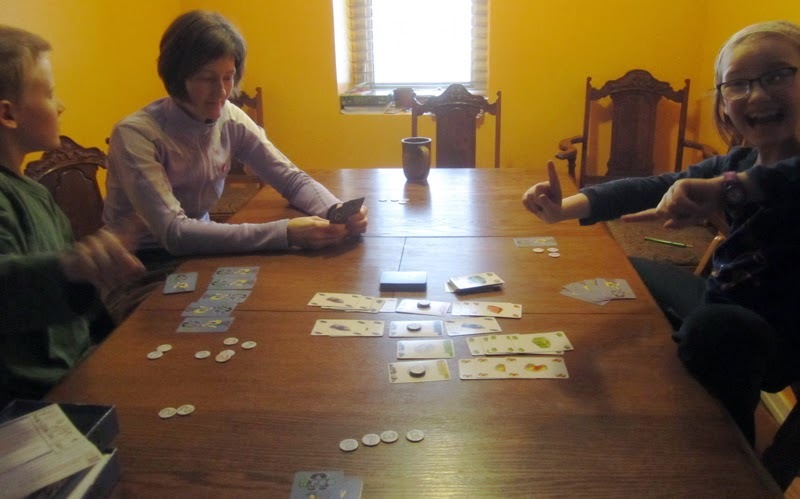 It’s a Reiner Knizia game, so it’s quick and fun enough and clever with a bolt-on theme. My friend John brought over his new game Onward to Venus – which is a super fun game designed by Martin Wallace based on the Doctor Grordbort graphic novels from writer/artist Greg Broadmore. 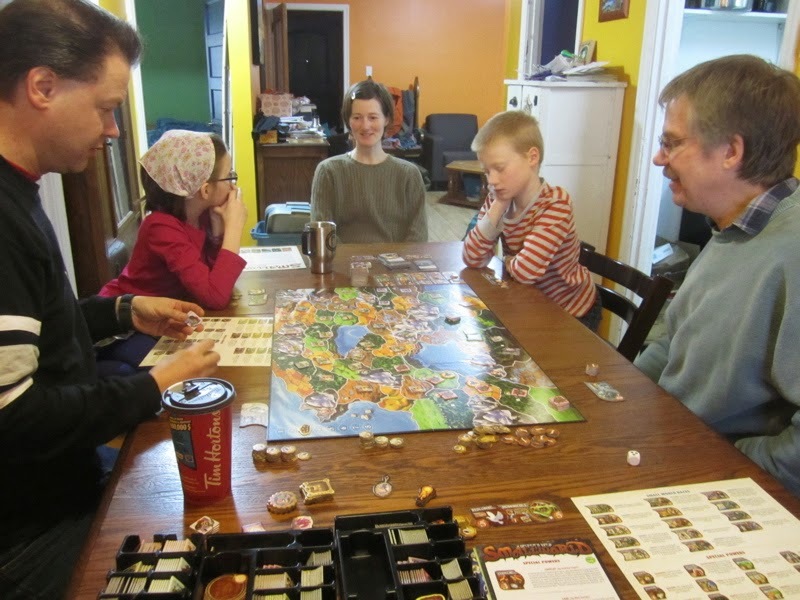 I got to play the British Empire, Amanda was France, John the Germans, The Girl played the Russians (because… ballerinas…), and The Boy played the USA. Let’s just say that the sun does not set on the British Empire! Huzzah! John also got me two of the graphic novels for my birthday - which was pretty awesome - THANKS! In the evening Amanda and I wandered over to the Persephone Theatre for their performance of Mary’s Wedding - which I thought was really well done. 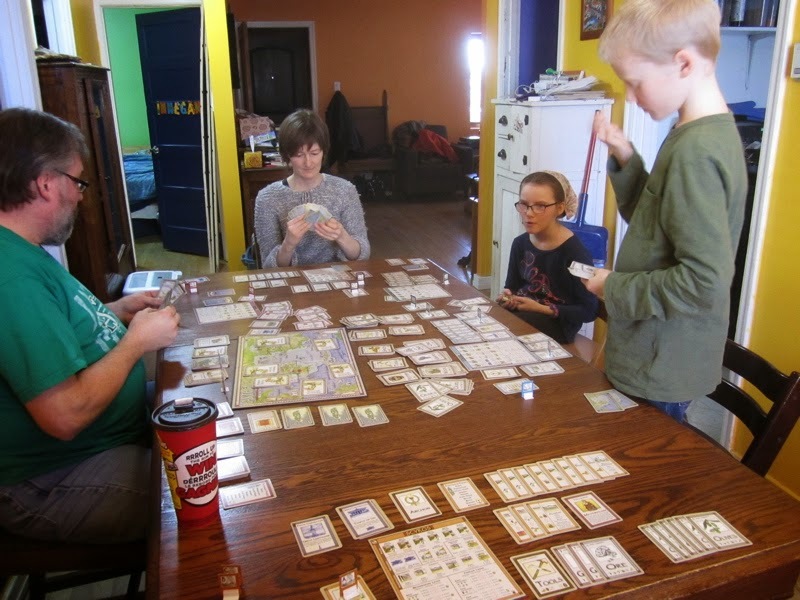 John stopped by again this afternoon to join us for a five-player game of Parthenon: Rise of the Aegean. We’ve played this a couple times over the last month. I really like it. You play an island in the Aegean and start with two villages that generate one of six different types of basic commodities. With those you trade with other islands (players) or neighboring or foreign lands to get different commodities to build other villages, or workshops, or agora structures on your island. The first to build all six villages, two workshops, six agora structures and two wonders wins. 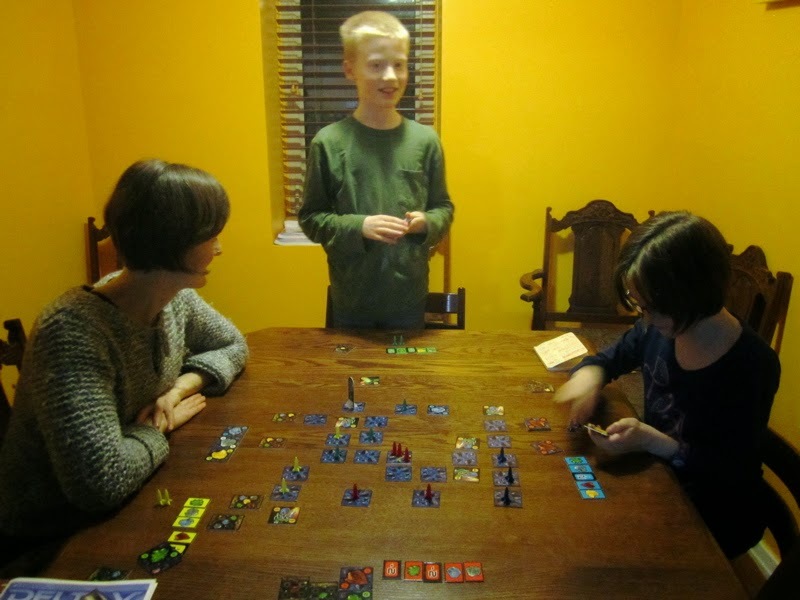 I don’t know if we’re getting better at it of if it just gets easier with more players - The first time we played (a three-player game – me and the kids) I don’t think anyone finished building everything. 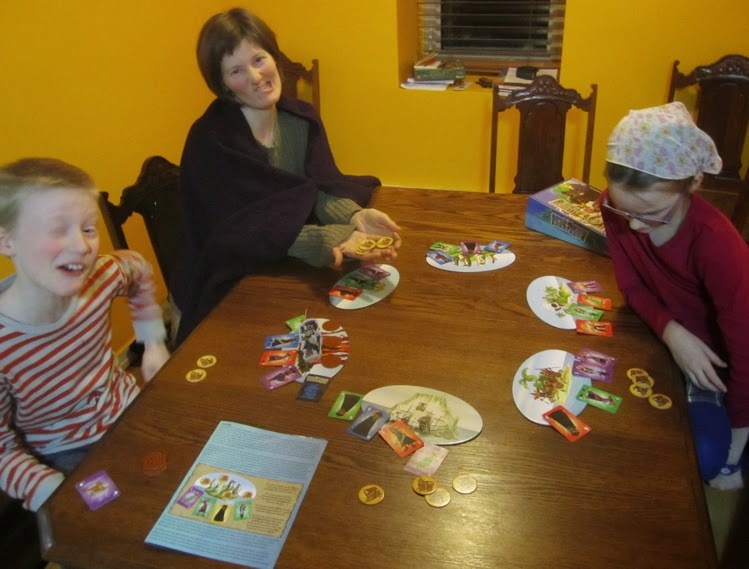 The second time we played (four-player – me and Amanda and the kids) both The Girl and I finished on the very last turn. This game The Girl (who is eight) beat us all by finishing all her buildings with two turns left to go!? 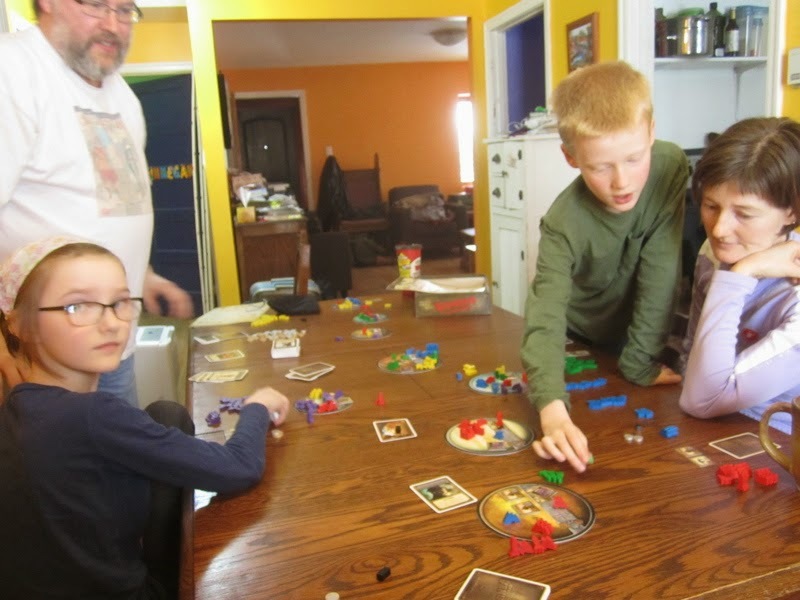 I don’t know about Amanda and The Girl, but The Boy scored 3 or 4 contracts for a total of 20 points, I completed two… for a total of -1 points… Clearly I should not be heading up any mining operations in deep space!! 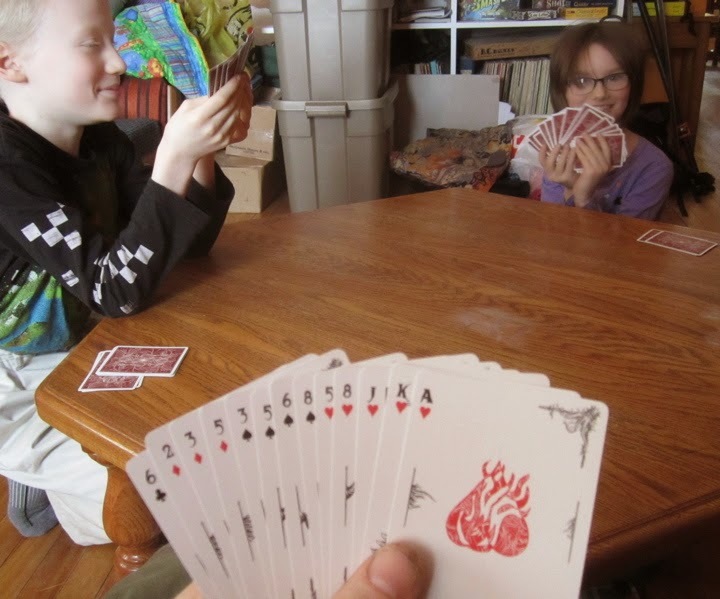 Oh and over the weekend we played a few games of Hearts and Kaiser – which I’ve been teaching the kids with my new fancy schmansy deck of Cthulhu cards! Now to get back to some miniature gaming! The first batch of the remiaing WW2 Soviets. 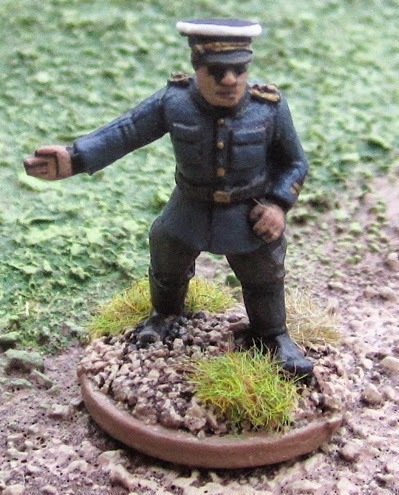 I’ll hopefully have another post next week with the last of them – then perhaps I’ll update the 28mm World War Two Gallery with pictures of the complete force. 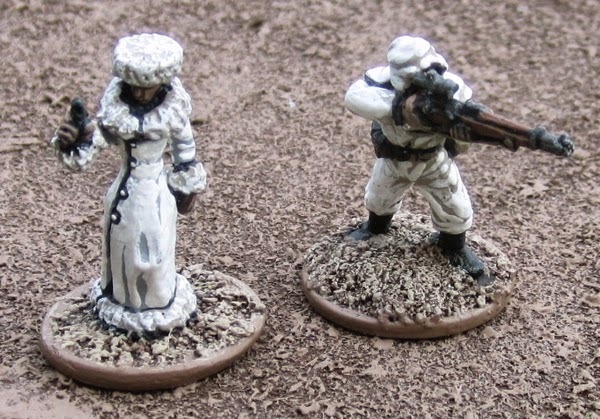 The aforementioned NKVD agents from Black Tree Design. 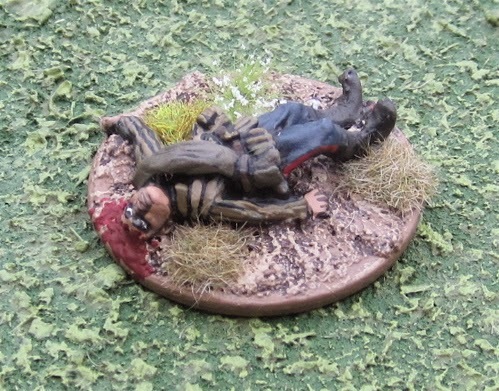 Dead NKVD agent – actually just a regular dead Soviet infantryman – but this one didn’t have a helmet (as most of them do) so I painted him to look a little like the NKVD agent so I’d have a casualty to plop on the table if any of them die – just to add to the horror of it all. 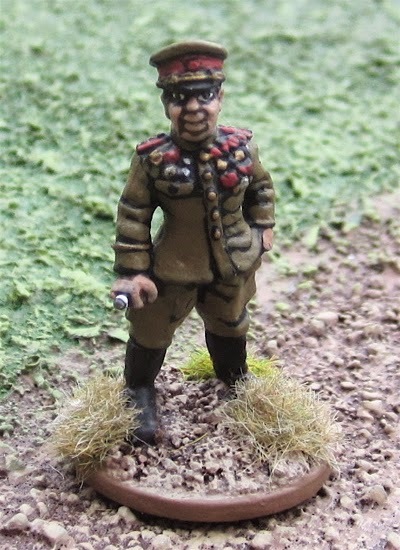 Soviet General from the Black Tree Design Men of War line. 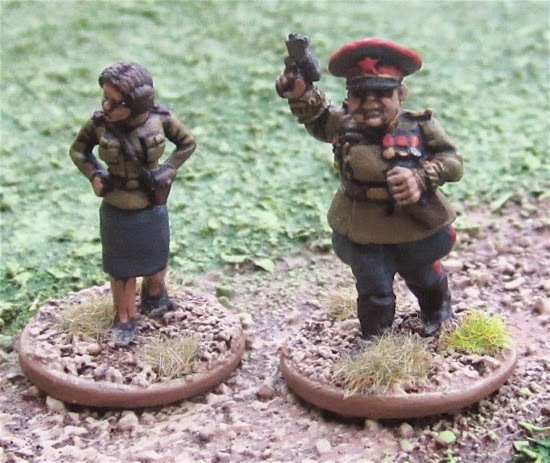 Two soviets from Blue Moon Manufacturing. 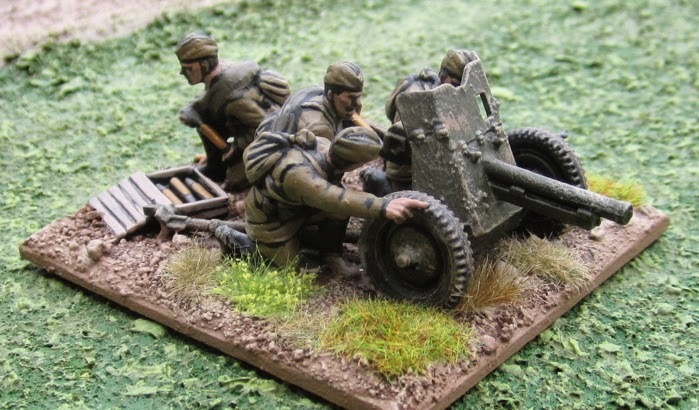 Finally two guns from the Plastic Soldier Model Company 28mm Anti-tank gun kit – it comes with two gun carriages and crews and barrel options to build either 45mm M1937 anti tank gun, 45mm M1942 anti tank gun or 76mm M1943 infantry gun – as I already have a 45mm M1937 anti tank gun (from Bolt Action) I built the other two options. 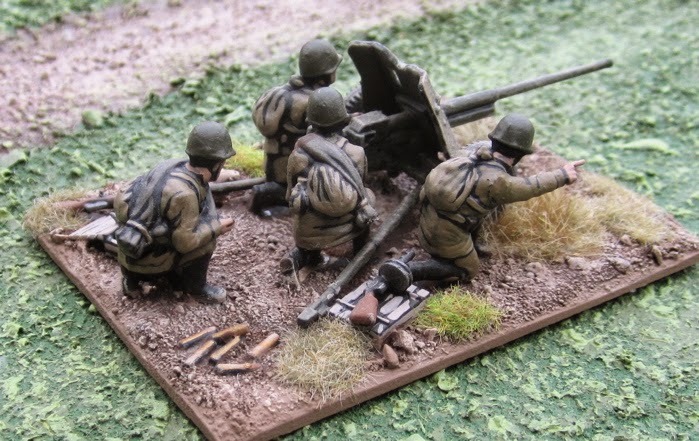 45mm M1942 anti tank gun and crew. 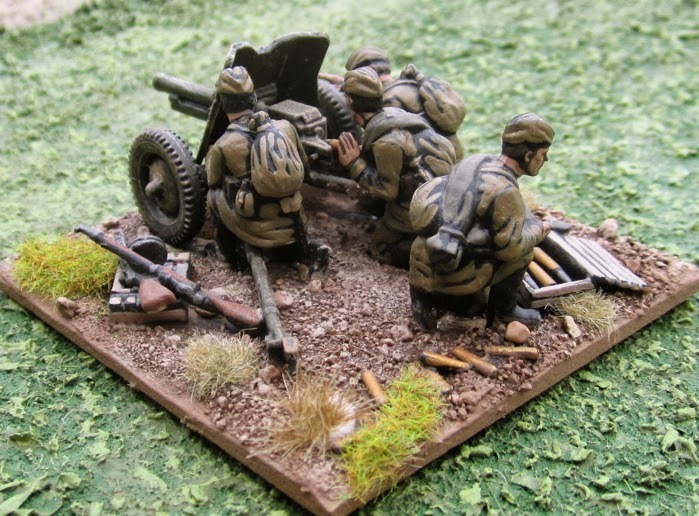 These are nice little kits that give lots of little bits to make a bit of a diorama – shell casings, ammor crates, rilfes, etc. Another shot of the 45mm M1942 anti tank gun. 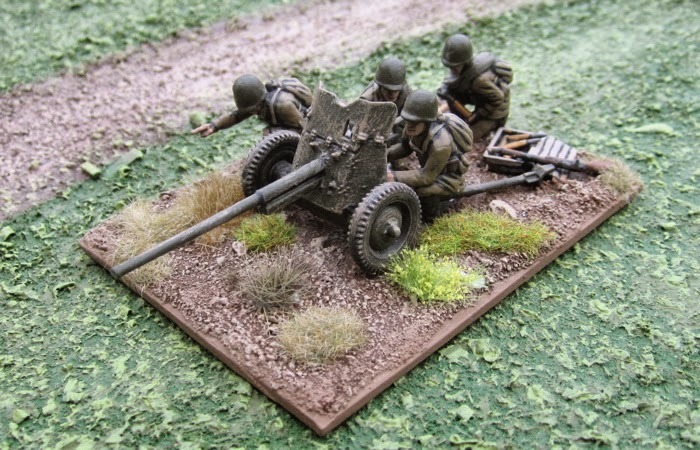 Again with the 76mm M1943 infantry gun. I also just finished reading Flying Lead and the lastest update for the Galleys and Galleons play-test rules and I am eager to give both a try in the next week!